You have 10 minutes to tell a story. What will it be? Through this festival, Theatre Oxford encourages creativity and advances its mission to make the theater accessible and enjoyable for all. Submissions for the 2019 competition are due May 15. Please see further guidelines below. Good luck, and thank you for letting us read your work. *Production dates and times to be announced. Usually, production takes place in October at the Powerhouse, Oxford’s arts hub. The play, exclusive of title and cast pages, may be no more than 10 pages. Play should have 2-4 characters and minimal props and costumes. Submission fee: $10 (U.S. dollars). On the online submission form (see “How to Submit Your Play” below), include your name, play title, address, and phone number. 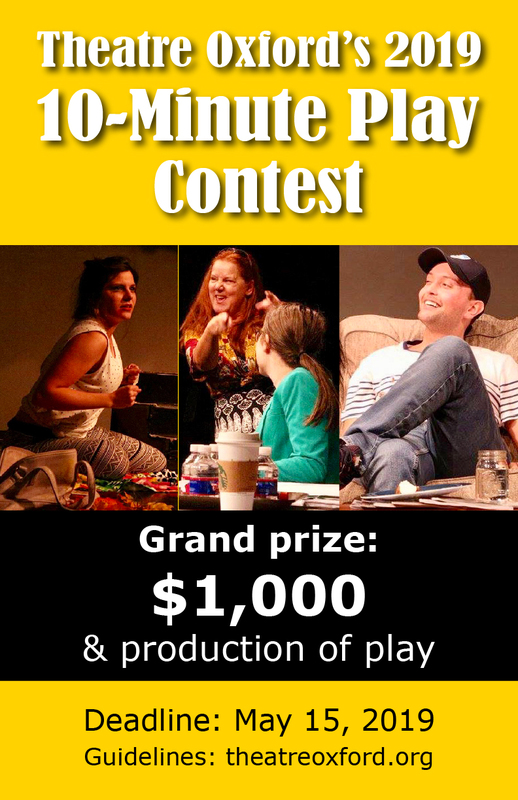 The 10-Minute Play Contest uses an anonymous review process. This means all author information (including your name) MUST be removed from the manuscript text body, headers, and file name. The manuscript should be saved and uploaded as .doc, .docx, or .pdf. Authors may submit multiple plays, but each play submitted must be accompanied by an entry fee. First page: Title, cast of characters, time and place information. Second page: First page of the script. The other pages of the play follow. NAME OF THE PLAY AND PAGE NUMBERS ON EVERY PAGE, starting with the first page of the script. All plays are judged blind. Five finalists will be chosen; only they will be notified of judging results. All authors agree to permit Theatre Oxford to produce their contest-entry play if the theater should wish to do so. Authors retain copyright and full ownership of their plays. Go here to fill out the submission form and upload your play. Pay the submission fee ($10 per play) via PayPal to theatreoxford@gmail.com. Once you’ve sent us your play, you will receive an automated confirmation via email. Please query if you haven’t received this confirmation within 24 hours: oxford10minuteplays@gmail.com.